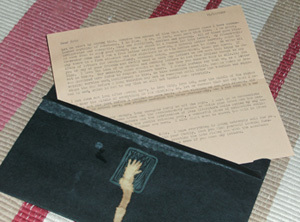 A friend of mine recently started his own letter writing service – A Literal Letter Service. Based in Iowa City, Eric and his colleague John will write a letter of any kind on your behalf and send it to a person nominated by you who you feel could do with a well written and heartfelt letter. Choose between a variety of “voices” including “gracefully gallant”, “cryptically enigmatic” and my personal favourite “light like helium”! List topics to mention and specific (verbatim) messages to relay as well as the option to have your letter typed (on an old school typewriter) or handwritten. The service is entirely free – although all donations are gratefully accepted. Pic below is of the letter I received from said friend … my favourite piece to quote from the letter would have to be “I must go to contemplate the wonders of the moon trees and the revolutionary nature of white pine trees and the secrets of braille and semaphore and the intricacies of jazz literature while pacing my way back and forth underwater in the public swimming pool, a wonderful place of collective solitude and quiet, a place many ideas are born.”…..Who doesn’t want to receive a letter like this?! To order your own letter, simply visit the A Literal Letter Service website.